These organisms are considered resistant to all penicillins, cephalosporins and macrolides. Though MRSAstrains may be reported as susceptible to Fluoroquinolones, aminogycogides, chloramphenicol and doxycycline in-vitro, these drugs are NOT to be used alone or as initial treatment for serious MRSA infections. Rifampicin use should be avoided in diseases other than Mycobacterial diseases. The drug of choice for treatment of infections due to MRSA is the glycopeptides i.e Vancomycin and Teicoplanin. Linezolid can be used to treat skin and soft tissue infections caused by MRSA. Mupirocin local application (intranasally bid x 5 days) for eradicating nasal carriage. Daptomycin: Daptomycin is an intravenous antibiotic approved to be used for the treatment of complicated skin infections and Staphylococcus aureus bacteraemia. Daptomycin should NOT be used for treatment of pneumonia due to its inactivation by surfactant. 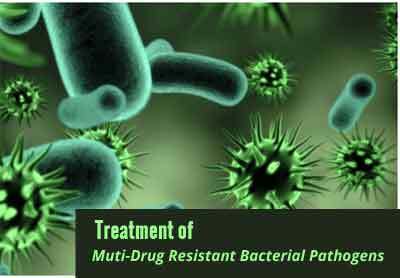 Enterococci are a therapeutic challenge because of their intrinsic resistance to many antibiotics. The acquisition of resistance to vancomycin by enterococci has seriously affected the treatment and infection control of these organisms. The treatment for VRE should be based on infection severity and in-vitro susceptibility of the strain to other antibiotics. Linezolid: Linezolid is the only drug specifically approved for the treatment of VRE-blood stream infections. Linezolid may be particularly useful in patients who require oral or outpatient therapy (when intravenous therapy is undesirable), who are intolerant to glycopeptides, or who have impaired renal function. Linezolid is a bacteriostatic agent; furthermore, linezolid toxicity when administered for prolonged courses may limit its use in VRE endocarditis. Ampicillin: Isolates that remain relatively susceptible to penicillin or ampicillin may be treated with high doses of these agents. Daptomycin: Not approved for treatment of VRE infection. Not approved for treatment of endocarditis. Limited clinical information for VRE, but bactericidal activity makes consideration of this agent as sole therapy in serious infections. However, emergence of resistance during therapy has been reported. Doxycycline: Not a first line therapy. For susceptible isolates, not for bacteremia or endocarditis. It should not be used as monotherapy. Nitrofurantoin:Uncomplicated UTIs have been treated successfully with nitrofurantoin. Fosfomycin: For urinary tract infections (cystitis) with isolates susceptible to fosfomycin. Chloramphenicol: For chloramphenicol-susceptible isolates of E faecium and E. faecalis. Not a first-line therapy and it should not be used as monotherapy. Gentamicin or streptomycin: To be used in combination with ampicillin for the treatment of enterococcal endocarditis caused by organisms susceptible in vitro to either agent; streptomycin is used when gentamicin cannot be used because of resistance. Tigecycline: Tigecycline has in vitro activity against a broad spectrum of Gram-positive and -negative bacteria, anaerobes as well as multidrug-resistant pathogens such as MRSA and VRE. However, there is not much clinical dataregarding its use for treatment of VRE infections. Extended Spectrum Βeta-Lactamases (ESBL) Producing Enterobacteriaceae. ESBLs are plasmid mediated β-lactamases that confer resistance to broad spectrum β- lactum antibiotics including third and fourth generation cepahlosporins, azetronam, and extended spectrum penicillins. These plasmids often encode mutations which confere resistance to other broad spectrum agents including aminoglycosides, co-trimoxazole and fluoroquinolones, resulting in organism resistant to most broad spectrum antibiotics. A major problem with ESBLs is their capacity to cause therapeutic failure with cephalosporins and azetreonam when host organism appears to be susceptible to these agents in laboratory tests. Hence, CLSI recommends that laboratories should report ESBL producing isolates as resistant to all penicillins, cephalosporins (including cefepime and cefpirome), and azetreonam irrespective of in-vitro test results. The emergence of ESBL producing enterobacteriaceae is related to indiscriminate use of third generation cephalosporins. The carbapenems (Ertapenem, Meropenem and Imipenem) are currently considered the drug of choice for serious infections caused by these pathogens. Piperacillin–Tazobactam and Cefoperazone- Sulbactam may be considered options in mild infections and when ESBL producers are demonstrably susceptible in -vitro. Combinations of ESBL or AmpC and porin loss: Porin loss is often unstable and may impose afitness cost, meaning that these strains rarely spread. Ertapenem is particularly affected. Most carbapenemase producers are extremely drug resistant: being resistant to β-lactam antibiotics, aminogycosides, and β-lactam–βlactam inhibitor combinations. Polymyxins, tigecycline & fosfomycin are the agents with most frequent in vitro activity, but all have limitations. Dosage will vary with the patient and infection site, but should be on the principle of ‘highest safe’ rather than ‘minimum potentially effective; durations should be as standard for the infection type. Colistin – Case reports of successful use in a range of infections due to carbapenemase producers. Tigecycline:Active in-vitro vs. most carbapenem-resistant E. coli. Licensed for complicated skin and soft-tissue Infections and complicated intraabdominal infections. Case reports of success in various infections with carbapenemase producers. Low blood concentrations; off-label use should be cautious for blood stream infections, unsuitable in urinary infections as only 22% excreted in urine. Excess deaths in some trials, especially ventilator associated pneumonia (not a licensed indication). Others: a few isolates are susceptible to other antibiotics including e.g. chloramphenicol, ciprofloxacin and cotrimoxazole. Most producers, however, are resistant to these drugs. Improved laboratory detection and reporting of MDRO. Enhanced infection surveillance and control in ICUs. Prevent spread by barrier precautions : Gowns and gloves. Restricted use of 3rd generation cephalosporins.